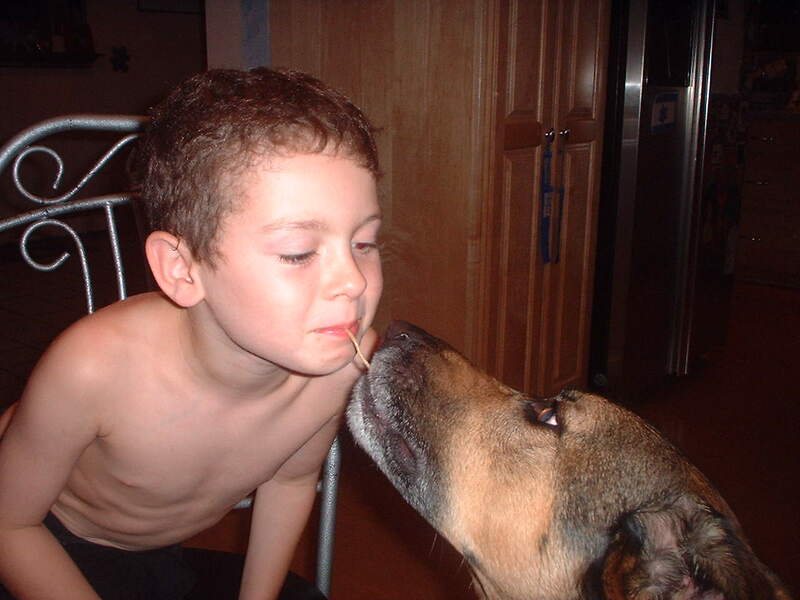 This month’s newsletter is dedicated to my recently departed dog Biscotti (pictured above with my son Ben about 10 years earlier showing their beautiful trusting relationship). Biscotti reinforced in me (and my children) the values that we hold true in business and life. After 15 years of loyal companionship and love, Biscotti is no longer with us, except in spirit. What are the most important traits that define a business and exemplify its brand? They include: establishing relationships built on trust, being loyal, making good connections, following through and showing unconditional compassion. Those characteristics are ones exemplified by our canine companions and the reason we call dogs ‘man’s/woman’s best friend.’ Biscotti held these traits, and as a member of our family, he was loved and respected by all. In the best business relationships, these same characteristics are self-evident. In the worst, they are completely mutilated, and my Lobster Bake story unfortunately shows the complete obliteration demonstrated by the owner while his young crew showed the best of these qualities. It all began when I saw a Groupon for a Lobster Bake and thought – wow, what a great idea for my son’s graduation. I looked up the company, Saldoni’s in North Chelmsford, MA, (yes, in this rare instance, I am sharing the company’s name) and didn’t find anything negative about them. Since the Groupon was a bit vague, I called the owner directly to make sure I understood what was included, and he pitched me an offer to go directly through him. Knowing that Groupon would have provided him just 25% of what I paid, it sounded acceptable, and I hired his team months in advance. He told me his crew would arrive at 5 p.m. on the day of the event to setup and we’d be eating around 6 p.m.
A few days prior to the event, he called me to confirm, and we reviewed times again. Things, however, went downhill from there. On the day of the party, no one showed up at 5 p.m. The owner didn’t answer or return my calls to him at 5:15 p.m., 5:45 p.m. or 6:15 p.m. My messages began in a gentle tone and then escalated as time passed. I grew annoyed as my guests grew hungrier. At 6:20 p.m., he finally called back. That’s when the ugliness began. He told me he was sorry, he was catering another affair, and didn’t know where his crew was but that he would solve the problem ASAP. They showed up a few minutes later looking innocent and honestly surprised when I asked them why they were so late. They told me they were instructed to arrive at 6:30. Nonetheless, they could not have been sweeter. It was obvious that they felt terrible and quickly pulled things out of their car to begin the lobster bake. Immediately, I felt better seeing this as a communication gaffe that wasn’t their fault but clearly the owner’s responsibility. I was watching them work hard to set up the equipment in my back yard when the owner called back and told me, “My crew had a flat tire!” Really? I exclaimed because they told me they were instructed to arrive at 6:30 p.m. I asked, “Which lie is the correct one?” and he got mad at me and said, “This is my business, and they had a flat tire.” I knew he wasn’t telling me the truth but checked with them any way. They were as surprised by the lie as I was and they were looking me in the eye telling me there had been no car problems. The situation then went from bad to ugly. After learning that the owner had thrown his team ‘under the bus to protect himself,’ I then discovered there was a problem with the equipment. To make a long story short, they couldn’t get the water to boil because the equipment wasn’t working. Two hours later, we gave up with their efforts and attempted to cook the lobster on my stove (in my lobster pot) and finally got them semi-cooked by 9 p.m. The rest of the food couldn’t fit in my home-style pot so it had to be thrown away or frozen (anybody interested in frozen corn? I have a lot). Talk about a WOW (NOT) experience! This was beyond disappointing. To top it off, the owner told me his policy was to never provide refunds (even when he’s at fault?) and kept insisting that I accept another meal on ‘the house’… personally cooked by him. Seriously, the last thing I wanted was this dishonest business owner, who treated his staff with disrespect, to cook a meal for me and my friends. It took me two days and one nasty YELP review (social media can be quite powerful) to convince him to give me a refund. Let’s face it, people make mistakes and equipment fails. I am very much pro small business and would have forgiven him (and not gone to the web to voice my disgust) if he had been honest. But when he tried to place the blame on his honest employees… that was the last intolerable straw for me. What does this tell us about his business and his brand? Nothing positive, for sure. He’s not trustworthy, doesn’t deliver on promises made to customers, is unfaithful to his employees and doesn’t follow up. If only he had taken a lesson from my dog BIscotti or perhaps yours, and shown loyalty and compassion… he wouldn’t have a really awful review on the world of social media (feel free to check it out). In closing, as you manage your business, always keep in mind the important lessons of honestly, trust and loyalty that our four-legged friends teach us every day. Now, please excuse me as I go give our other dog, Twizzler, a belly rub! Next month I will share stories of my adventure in Nigeria as I head out next week to speak at conference on innovation and entrepreneurship in that fascinating country.